I was born in St. Joseph's Hospital in Brainerd, MN, in 1973. After living briefly on Oak Street in southeast Brainerd, my family moved to Baxter (to a road now called "Marohn Road" due largely to its high concentration of confused people). After a few years we purchased the original Marohn homestead (a couple miles away, still in Baxter) and moved to the farm, where I lived through high school. I graduated from Brainerd High School in 1991. After my undergraduate studies, I returned to take a job as an engineer in Baxter. Following graduate school, I started CGI's first planning office in downtown Brainerd. Community Growth Institute now has an office that is technically in Baxter, but only feet from the Brainerd boundary. There is an office space I covet in downtown Brainerd. I say all of this to establish my credentials when talking about Brainerd and Baxter. I know the area real well. When I say that I would love to do planning for the City of Brainerd, I am expressing a sincere and longstanding desire. This is my home town, and I'm a sucker for it, warts and all. Brainerd is the historic county seat. It is a railroad town established on the edge of a mining / logging / agricultural area. By nearly any stretch, it has suffered from neglect and is in a state of decline, despite recent investments in some areas. Baxter, in contrast, is the new town. When I was a little kid, it was an A&W Root Beer stand and a liquor store. Today there is an entire plethora of suburban fare: Super Wal-Mart, Target, Fleet Farm, Kohls, Penny's, car dealers, chain restaurants, etc.... Baxter has embraced a growth model and is largely seen as successful in how it has grown (so much so that Brainerd has tried to grab some of the action through annexation). Here is an aerial image of the two from Google Earth. Brainerd is the dense-grid area on the east while Baxter is the sprawling area on the west along the highway. The Brainerd/Baxter Regional Center. 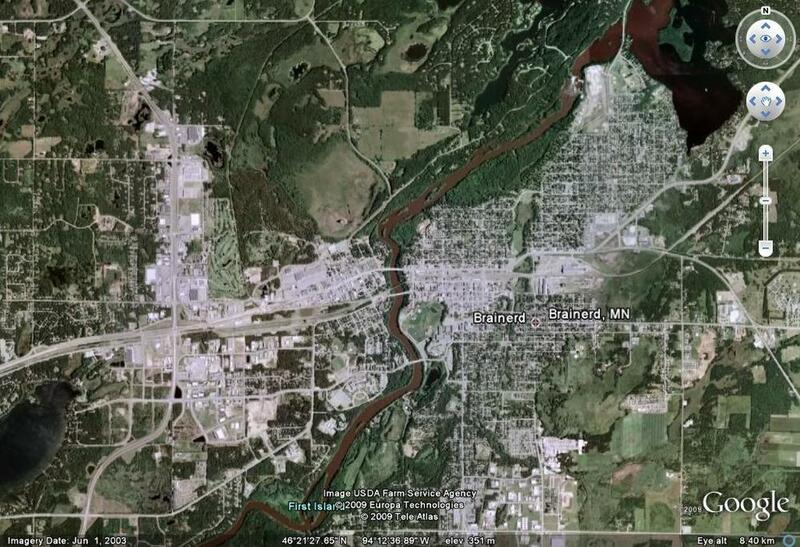 Brainerd (east side of picture) is an historic town that came to age in the railroad era. Baxter (west side of picture) is a new town that was developed almost exclusively in the automobile era. Not long ago, a former Brainerd resident transplanted to another small town asked me what Brainerd could have done to have avoided its current state of decline. It was relatively easy for me to click off ten "no-brainers" that, we agreed, would have set Brainerd on a different trajectory. It is kind of sad to think about what could have been. It is too easy, though, to simply sit and criticize the decisions of the past. I'm announcing a new regular series on this blog dedicated to strategies to make Brainerd and Baxter into Strong Towns. I've got small ideas. I've got big ideas. I'll try to roll out a couple each month in an effort to show that building Strong Towns is, more than anything else, really a change in attitude. Once you adopt a different perspective, the process becomes much more straight forward. We can use my hometowns as a platform for a broader discussion of Strong Town strategies nationwide, as there is a lot of commonality that we see between Brainerd/Baxter and much of Small Town America. Incidentally, I disagree with the conventional wisdom on Brainerd and Baxter. If I had to invest my savings in the future of one or the other, I would choose Brainerd. If it can shake its self-image and realize it is no longer a dieing railroad town but the center of the Central Lakes Region, great things can happen. Unlike Baxter, Brainerd can reshape itself into a Strong Town relatively easily. It has the DNA to do so, it simply needs to reconnect the strands. Baxter, while on top today, has a much more precarious future. It has developed in an incredibly inefficient way that is starting to manifest itself with the early signs of financial stress. The second generation of infrastructure, especially if done in a climate of slower growth, could financially bring Baxter to its knees. Reconfiguring Baxter into something efficient and financially sustainable is going to take a complete brain and nervous system transplant (or shock therapy). Possible, but more difficult. This will be fun and informative. Hopefully by looking closely at these two small towns we can help people nationwide look at their own small towns with a different eye. And if someday we do get to work for the City of Brainerd (or Baxter, if the right opportunity presented itself), we'll have lots of ideas to put into immediate action.